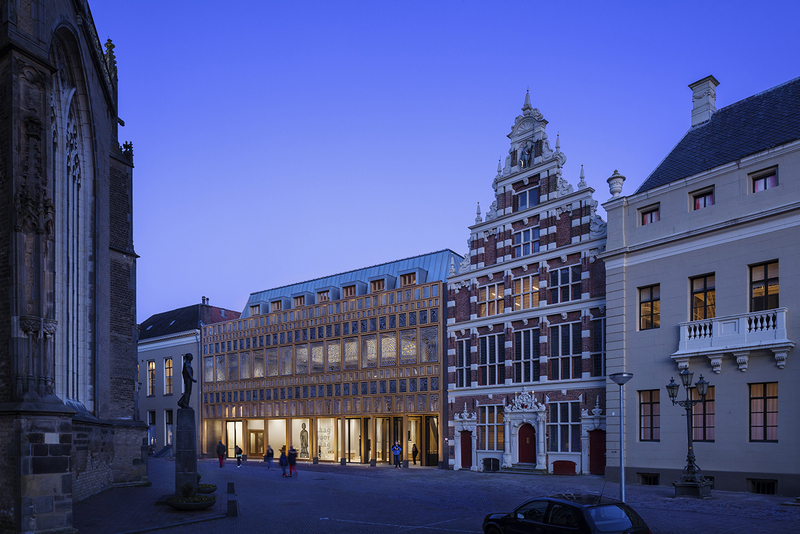 The new city hall in Deventer unites the old historical city hall with a new city office. The new building complex is located at the ‘Grote Kerkhof’ and extends as far as the ‘Burseplein’. The 24.000 m2 large project consists of 20.000 m2 new buildings and 4.000 m2 renovation and restoration of existing listed monuments. 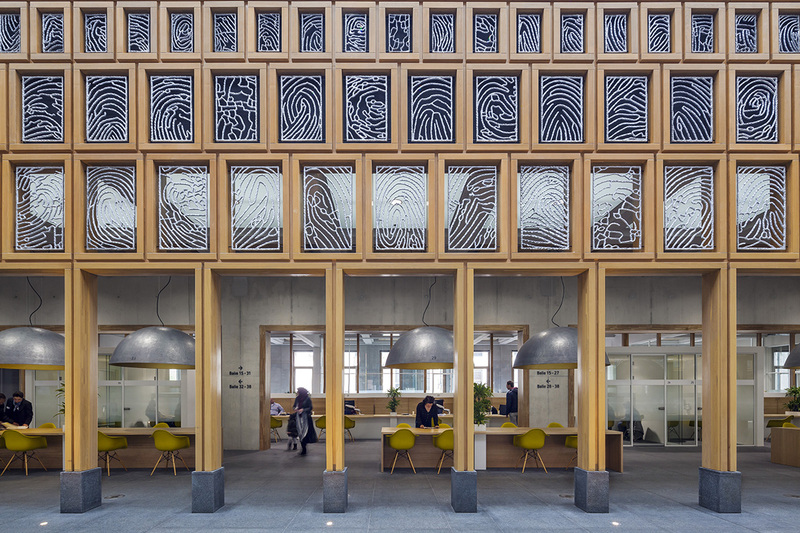 The project consists of an entrance building with a main building behind it and unites all of Deventer’s employees, formerly divided over the city, under one new roof. It houses the city council and all municipal services and invigorates a formerly forgotten part of the inner city. 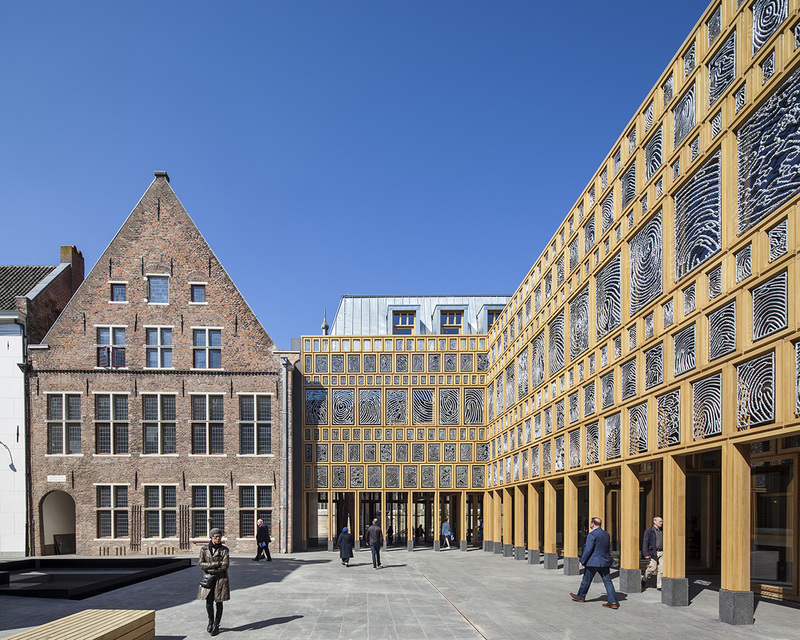 The City Hall’s design seamlessly blends in with Deventer’s typical urban tradition of gardens and squares that are interconnected via alleys, lanes, pathways and gates. The building is organized around two new public squares: an open court surrounding the former mayor’s residence and a covered inner square; the building’s central hall where citizens, visitors and employees can meet one another. Adjacent to the office buildings in the Polstraat and Assenstraat two large city gardens are situated next to the neighbouring residential buildings. At ground floor level the building creates a link between the city’s two most important squares through a new continuous route that starts at the ‘Grote Kerkhof’, continues via the open Mayor’s Court and covered central hall to the Burseplein and ends at the main ‘Brink’ square. Perpendicular to this passage is a second walking route that connects the inner city with the IJssel river shore. Both are public routes. At the first level a closed circuit has been made for City Hall staff and employees connecting all historical buildings with the new ones. This route lies around the Mayor’s Court and enables a fast connection between all functions and departments. The front building at the ‘Grote Kerkhof’ consists of two layers with a sloped roof and a facade composition with strong vertical lines, like its neighbouring buildings ‘de Hereeniging’ and the old city hall. This continuity makes the front building effortlessly fit in with its historical surroundings. By placing the roof backwards a city balcony is created. This makes the facade appear more separated, creating a recognizable facade at the ‘Grote Kerkhof’. The main building consists of three layers, like most buildings surrounding it. The tall vertical windows blend in with the architecture of the inner city and allow daylight to cast deep into the building, together with the skylight of the large hall. The main building has a roof surface consisting of alternating mansard roofs and green flat roofs, creating a skyline similar to its environment. The mansard roofs create spacious interiors in the attics. The roof terrace alongside the Mayor’s Court offers a panoramic view over Deventer’s inner city. Open filigree wooden frames and closed brick volumes alternate within the facades. The stone facades consist of large block masonry with protruding window frames. The bricks are multi-coloured creating a lively image. The filigree facades consist of a grid of different sized oak wood frames. The oak framework provides space to integrate contemporary art in the building’s architecture. 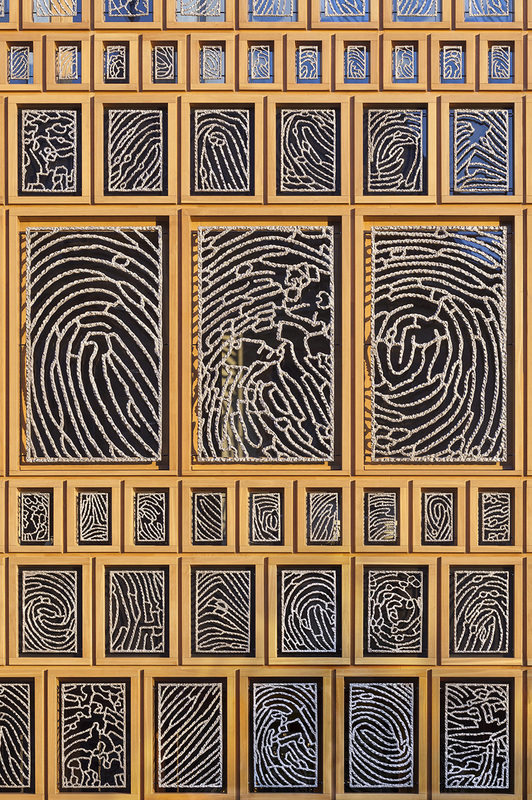 In collaboration with local artist Loes ten Anscher a series of aluminium grids was designed to fit within the oak framework, containing 2.264 unique fingerprints of 2.264 different citizens of Deventer. Spread out over the outer and inner facades of the building they form one large work of art. 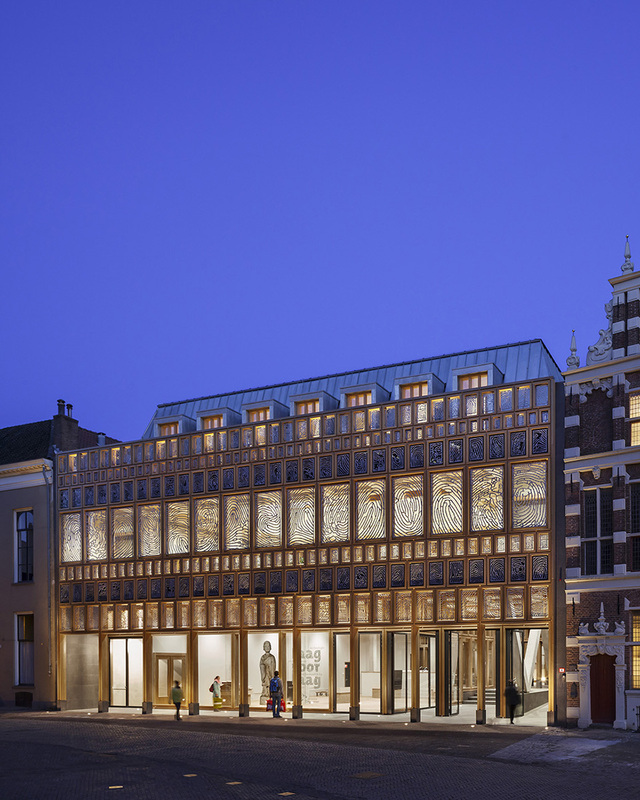 The visible presence of Deventer citizens in the facade turns the city hall into a true ‘Citizen House’. 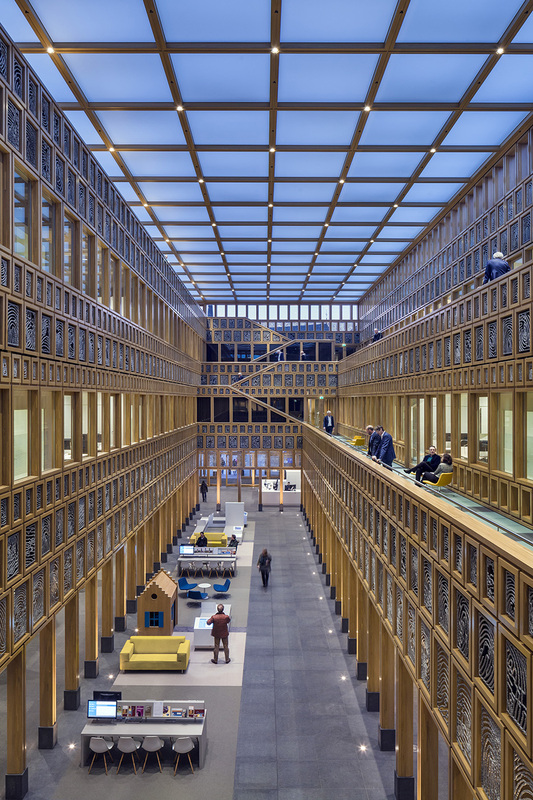 The Deventer City Hall is one the most sustainable public/government buildings in the Netherlands. Thanks to a clever design with tall spaces, vast amounts of daylight and air, optimized use of as many natural sources as possible, the implementation of green and multiple technical sustainable measures. The great amount of windows, roof lights and high ceilings allow natural light to enter the building everywhere, creating an agreeable working environment and simultaneously lowering the electricity consumption. The exposed concrete inside the building contributes to a high-quality, comfortable indoor environment: the concrete stores warmth or cold in various seasons. Concrete core conditioning is also used. The shed roof construction in the public hall prevents direct sunlight from entering and overheating the building. Ventilation ducts and grids in the windows and floors let fresh air seep into the building. By transporting this heated air out of the building via the atrium, surplus heat is used in an efficient way. The use of sunlight, rainwater and water from the IJssel river (for cooling and heating) increases the building’s sustainability with 25% as opposed to similar offices in the Netherlands. The City Hall received the Dutch sustainable GPR score of 8 to 9 as well as the international qualification BREEAM ‘Excellent’.